True DBGrid Pro allows end users to browse, edit, add, and delete data in a tabular format. True DBGrid Pro completely manages the database interface, allowing developers to concentrate on important application-specific tasks. 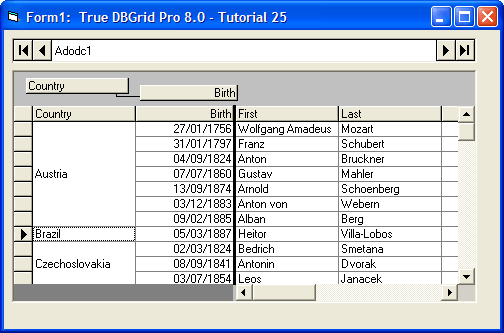 True DBGrid Pro can also be used in unbound or storage mode with a programmer’s own data source. True DBGrid Pro allows end-users to browse, edit, add, and delete data in a tabular format. True DBGrid includes dozens of advanced data access, data presentation, and UI features. Alternating row formats Enhances the readability of the grid’s display by applying different styles to even and odd numbered rows. Crosstab With the Crosstab feature, you can easily create a matrix-like presentation where multiple columns represent values of a single database column…and do it without writing complex code! For example, you can have 12 columns for months with monthly figures in cells, bound to a table where each monthly figure is stored in a separate row. This feature is made possible with the True DataControl Lite add-in that is included with True DBGrid Pro 8.0. Additional display modes You can present data in useful formats: Form View repositions data in a standard “form” that can be modified as needed, and Inverted Mode repositions rows as columns to provide a convenient “read down” format. In-cell editing using an external OCX Use an external OCX as the grid’s in-cell editor.